Last week was TAFTA’s Forum in Orange and I had a wonderful time. I struggle to describe these weeks (this was my 5th) – a couple of hundred textile fanatics, lots of learning and friendship and craziness – exciting, stimulating, sometimes overwhelming… There’s a lot of exuberance and fun but also the opportunity to really get into your particular subject since you spend Monday to Friday in the one class. Mine was Three-End Block Weaves with Jason Collingwood. I was so impressed by him, the intense focus and depth of knowledge, every detail considered to produce the best work he can – in his rug weaving, but also in his teaching. He had samples and could demonstrate and explain lots of options, but could also explain the reasons, the choices in pursuit of excellence in his own work, which mean he works almost exclusively with a reduced set of techniques. He doesn’t see it as restricting or constraining, but as working in harmony with the structure/technique. He also takes a very practical non-precious approach to his equipment (loom), modifying it in all sorts of ways to make his work efficient and achieve the best results he can. I admire this enormously. After considerable reflection I am comfortable that I don’t aspire to it myself. Part of course is that weaving is Jason’s profession, but my hobby. Part is the joy of exploration and discovery (which still counts, no matter how many have discovered it before me – and I agree can be found in deep as well as broad studies). Achieving mastery – perhaps one day I will be ready to make that investment, but quite possibly never. Sunday afternoon pre-class get -together: general introductions and background. Most of us brought looms already warped and part threaded. 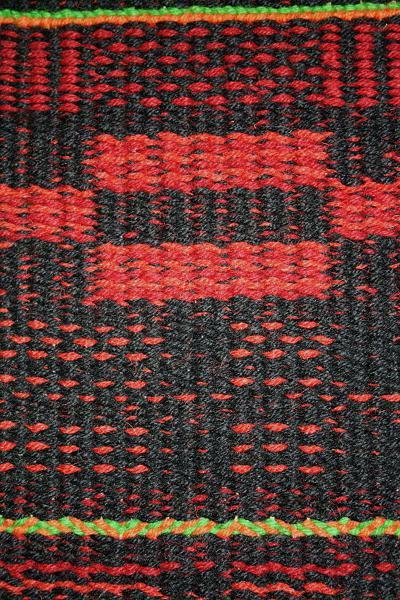 In 3 end block weave you have tiedown ends on shafts 1 and 2, then a pattern/background thread on either shaft 3 or 4. Jason’s instructions had us put the pattern/background thread in each block between empty heddles on shafts 3 and 4. That way we could change individual threads/blocks between pattern and background by tieing the individual thread to one of the empty heddles. Fiddly, but do-able. 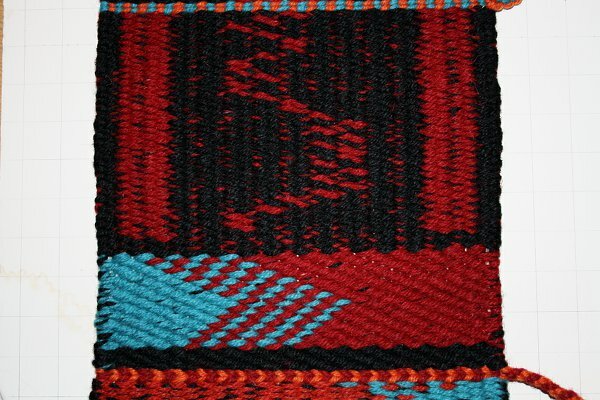 Going from bottom to top of the photo we have the header; twining (done to space the warp, then each day to divide up the sampler); some solid colour; pattern blocks, counter change and general play. We worked with “constant lift”, using weft colours to pattern, and “constant colour” where the weft colour order is maintained and the lifts change. We produced vertical and cross stripes, aligned and staggered dots, introduced a third colour (used in my “frame” section). As well as plain background we used different patterning in the two blocks. I ran out of time and didn’t get a log cabin sample done. Wednesday was a half day for class. The afternoon was free to take a break, explore town, or (in my case) continue work. 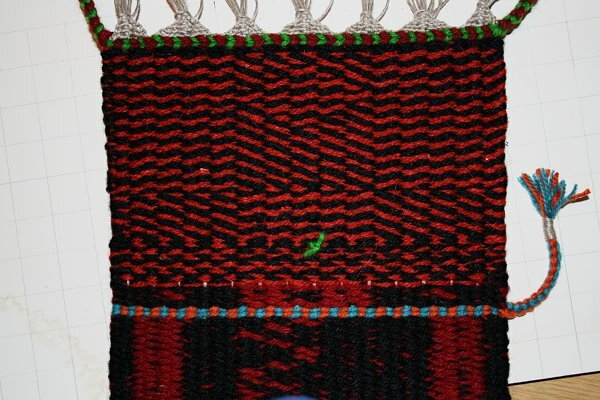 We worked on clasped weft, using very precise techniques and positioning – quite unlike the bits I’ve done in the past such as with “freestyle rosepath” . The focus was always kept on producing a structurally sound rug. We were able to use the lifts and patterning we had already learned, combined with the multiple colours. Once again I ran out of time – others in the class tried clasping 3 colours at once. There was also a rather neat “disappearing block” trick. On Thursday morning we changed structure to 2/1 double faced twill. I liked the graphic shape and colour combination I got in the blue/red area. 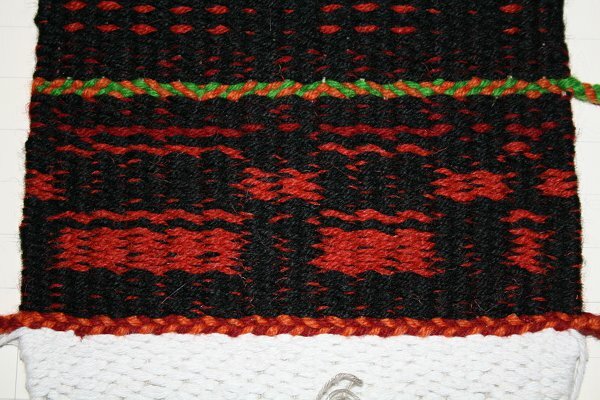 The twill line wasn’t reversed, just the positioning of the clasped weft. Again I ran out of time and didn’t try reversing twill lines, let alone having different colours / patterning on front and back of the cloth. In the afternoon Jason introduced us to shaft switching. Through the week we had been changing blocks to and from pattern and background to suit the various samples. As I mentioned in “day 1”, it was just a matter of tieing the pattern end to one of the empty heddles, either shaft 3 or 4. Flexible, but slow and fiddly. Now we did an arrangement of ties and knots to make it faster and easier to change each end – shaft switching, although a more primitive form that didn’t require any modifications to the loom. It’s beyond me to explain and a photo of my loom just looks a messy tangle. I found this article by Thelma Bodkin – the “threading detail” shown in the diagram seems to match what we did, but instead of all the fixings we used “boa” knots to select which way (to which heddle/shaft) the warp end was tightened. Naturally I used a bellringing pattern to test it out. That jagged red line is “stedman doubles”, at least in my eyes 🙂 I was changing the pattern end every 4 picks and actually started building some rhythm in the movements. The final day we looked at raised end pick up. 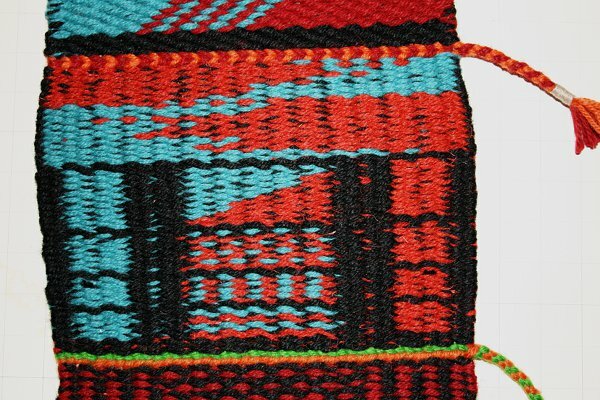 Jason tried to demonstrate on my loom – that thin area just above the blue/orange twining. He pronounced it the worst shed he’d ever had. Actually close to non-existant. All 8 of us in the class were using table looms, and this was just a step too far for mine. Jason also presented dovetailing – still on my “to do” list. Instead I tried a rather crazy counterchange pattern (the bit below the green tuft is where I misunderstood the directions and nothing was happening). The arrangement of blocks is actually easier to pick out in the photo – towards the top centre you may even be able to see a lozenge shape where I was combining shaft switching with the crazy counterchange. We finished off with lots of information about finishing, some ideas for useful loom adjustments and general design considerations. Non-weaving, but a personal triumph: As a wrap up to the week, Friday night was LA PARTY! Last year I was too tired and sore to go – I crawled into bed at 8pm with the distant sounds of music mocking me. The next week I joined a gym, started overhauling my eating and used LA PARTY as my focus. A year later and 29 kilos down, I got there and was on the dance floor most of the night! A great end to a great week!! Well, not quite the end. Saturday morning was “open house”, where classes displayed their work for each other and visitors from town. There was also the “Heathen Bazaar” and final chats with old and new friends.